MyMemories Blog: Wednesday Challenge from Debbie at SnackpackGu and MyMemories! Check it out! Wednesday Challenge from Debbie at SnackpackGu and MyMemories! Check it out! In just 2 short weeks Valentine's Day will be here. And hooray - it's on a Friday this year. What luck! 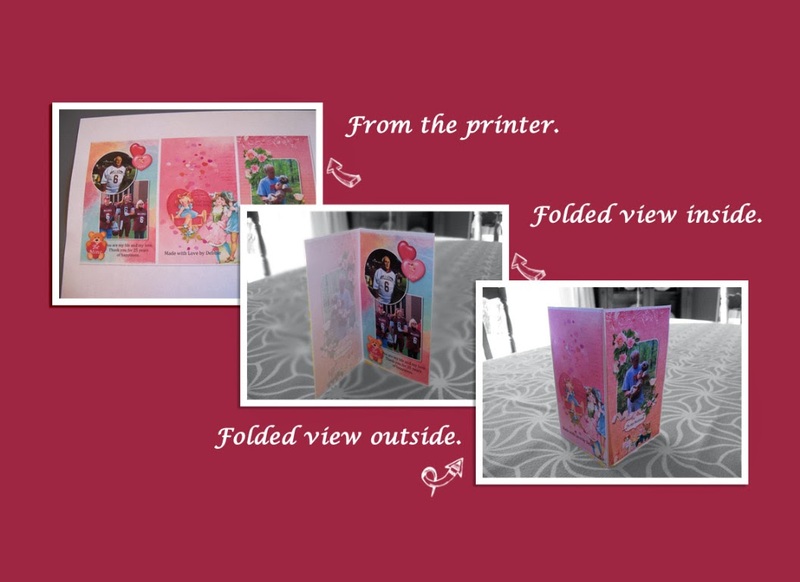 So what would be better than making our very own personalized Valentine card for our loved ones. And yes, you can do this in MyMemories with 1 piece of paper. This is one way to do it. Start with a 8.5 x 11 blank page using the landscape orientation. Now add backgrounds to the boxes ( I used my new kit 'Be Mine' which is on sale now for $3.50 http://www.mymemories.com/store/display_product_page?id=SPDR-CP-1401-51031&r=snackpackgus_designs - but you can use whatever you like.) Remember that the far right box will be the front of the card. The far left will be the inside and the middle box will the back. Now decorate each 'box' according to their position on the card. When you're done, save the card and export it as jpg to your favorite folder. Now you can print it on either paper or cardstock. I like to print from Picasa but you can choose whatever program you have. And noow you have a hand-made card that you can give with love on Valentine's Day.